Shining in the Darkness, called Shining and the Darkness (シャイニング＆ザ・ダクネス) in Japan, is a 1991 game by Sega and Climax Entertainment for the Sega Mega Drive. It is the first game in Sega's Shining series — but unlike most of the rest of the franchise, this one is a 3D dungeon-crawler RPG. The game takes place in three areas — the castle (where you talk to the King and his servants), the town (where you can buy weapons, armor, and items, save your game and heal in the church, and talk to townsfolk), and the Labyrinth (the actual dungeon). In the castle, towns, and buildings, use and to navigate and to interact. The Labyrinth is (appropriately) a 3D maze. moves forward, and turn, and moves backward. and open a menu at the bottom of the screen where you can do mundane things to the members of your party. Enemy encounters happen randomly throughout the Labyrinth — the same menu is used to attack. Should you die in battle, you will be taken back to the church in the town, losing half your collected gold in the process. Shining in the Darkness was a joint venture developed by Sega's newly founded Sonic Co. and a team at Climax Entertainment, headded by Hiroyuki Takahashi, a rising stars in the world of RPG development (Takahashi had previously been involved in Enix's popular Dragon Quest series, so were seen as a good fit for the project). However, corporate reasoning gave Shining and the Darkness a minimal development budget, and a small four-man team, meaning Climax were responsible for the bulk of the game's development. 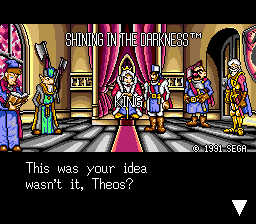 Nevertheless Shining in the Darkness was a success for the company, and led to other entries in the Shining franchise, most notably the next game, Shining Force. Main article: Shining in the Darkness/Magazine articles.